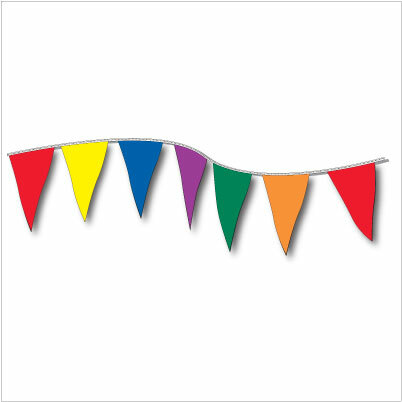 Our 100' (30m+) Multi-colour pennant string is made of a weather-resistant poly material. Evenly spaced this pennant string has approximately 20 various colour triangle pennants with ample slack on both ends of approximately 12-18" to secure the pennant string for display. Each individual pennant is sized 12"x18". *Please Note* Colours and shades may vary from picture displayed.